2017 was a good year for me. I started out with some actual plans (gasp). I did some of what was on the list... Ontario Southland, and some guest posts... I got a bit distracted on the grain elevator front by the renewed grainelevators.ca site. I did some traveling... although by past years' standards, I didn't travel that much. Tiny Piney, Manitoba - my third most popular post of all time, with 49 comments to date! Italy... haven't blogged about that yet! We had some foreign power in Winnipeg via BNSF detours (at night, too), plus a few oddballs like a Kansas City Southern unit and ex Warbonnet leased power on CN. The Canada 150 celebrations gave us some VIA wraps as well as the CP Canada 150 train. 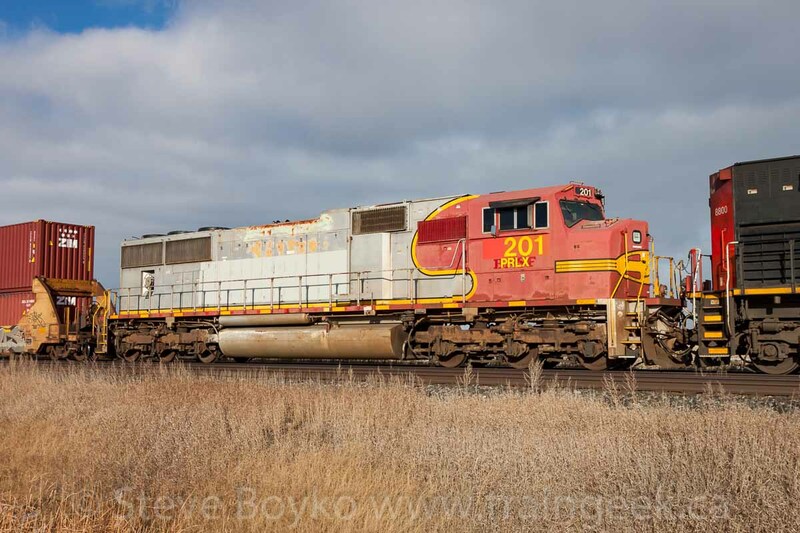 CN ran a special caboose train for their employees, and CP had their annual Holiday Train. Adobe Lightroom says I took a little over 15,000 photos and videos in 2017, which is a bit ridiculous. Keep in mind that my wife and I went to Italy in May-June which accounts for a bit over 4,000 photos. 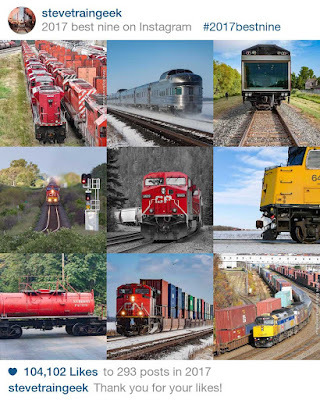 Blog-wise, I posted 59 times on Confessions of a Train Geek, which is a new low. I think I'm posting longer and more detailed content, so I'm OK with that lower post count. Only 6 posts at Confessions of a Model Train Geek... which reflects my level of model train activity. I just haven't been really into it. That's OK - it's a hobby. I've been really pounding it out at my new site, Grain Elevators of Canada. 231 pages online so far and more to come! I have a few more contributors sending photos to me so more and more elevators will be coming online shortly. I've been so impressed by how many people have stepped up and freely offered their photos for sharing. Thank you. I had a huge spike in traffic in April when I posted the Piney train station post. It went viral - maybe my first - and for a couple of days I had over a thousand pageviews a day. After that - back to the usual. My 40 Mile Railway post was well shared but not on the "Piney scale". I spend most of my social networking time on Facebook and Instagram, and occasionally Twitter. My Traingeek Images Facebook page has been growing pretty rapidly over the past couple of weeks. I'm not sure why but it's been getting a lot of "likes" such that I'm at 1064 page likes and growing by about 20-25 a week. That many likes and $2.36 will buy you an extra large coffee at Tim's. On Instagram I cut back to posting 3 images/week, at the same time as I post on Facebook and Twitter. Here are my "best nine" for 2017 aka #2017bestnine. 104,102 likes, and $2.36, will buy that coffee at Tim's. I'm rolling in the "likes". Cha-ching! I'm being a bit sarcastic about the number of "likes" because I don't really think they are worth worrying too much about. People will like what they like, and if they like my photos, great! You're here reading because you like my stuff, and thanks for that! I try not to obsess about how many likes my photos and posts get, because I share photos and my words because I want to. I'm just glad some people see them. Please don't think I don't appreciate you reading my posts. I do. I really do. I just don't get upset when I don't get "enough" likes. So what's on the agenda for next year? I'd still like to go to Assiniboia, SK. I've planted the idea in my wife's ear and hopefully I'll get out there in the spring. Churchill seems "right out" since the rail line is still broken and may never get fixed. I've had a few people ask me to write a Manitoba grain elevator book. I haven't the slightest idea how to get a book published but I think I will look into that. We're going to Edmonton and Jasper this summer, so there will be railfanning! I've been to Edmonton but not to Jasper, so I look forward to more mountain trains. I'll be posting more grain elevators on Grain Elevators of Canada. Hopefully I'll photograph some more myself! I have some ideas on eBooks and so forth. Pretty soon I'll send a survey out on my mailing list so keep an eye out for that. Thanks to commenters Jenn, George, Eric, BW, Jason, Doug, Michael, Tom, Mike, 5879East, Rick, Chris, André, David, James, Jim, DaveM, Karl, Patrice, Richard, Taylor, GP9Rm4108, Bryan, Carol, AJ, _Don, Bill, Sheldon, Brad, Red River Rail, Harry, Jeff, Cornergas Craig, Andrew, Brian, wainair, RCP, Doonhamer, Alexandre, jonovision_man, Heinz, Dale, myhydro, DaveM, Lee, Dash 8, Mark, Rory, craigpei, Carolina Caboose Captain, Shane, shnorth123, and of course, Anonymous. You can see my 2014, 2015 or 2016 year in review. PS: hey, why not join my mailing list and get a weekly email filled with photos? 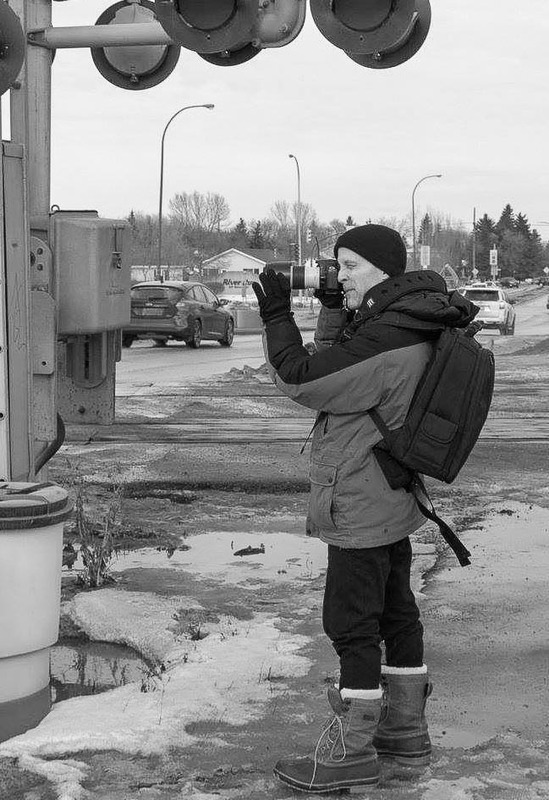 Had a great time on Wednesday exploring around Winnipeg. Look forward to the next encounter... happy new year! Good wrap-up, Steve. I had to do a double-take. CofaTG and TT posted 59 times each year? You have sunk to my level, or, I'd say you've calibrated it just about right [smiley face]. Regarding likes and competition, it's natural. Steel sharpens steel. But counter-balancing that is the social side and getting out shooting with others. I'm not very competitive, I don't think. In fact, I'm pretty non-competitive. Actually, I'm the most non-competitive person I know. That makes me NUMBER ONE!!!!! SeRiOuSlY, to me, likes aren't worth the paper they're printed on - wait, they're not printed on paper! And blog pageviews? Who knows how many are Russians? Anyway, it's nice to know a fellow blogger who actually has a plan. Wishing you much continued success in 2018, and a wonderful year to come for you and your family, Steve. I was just in The Pas for Christmas. It looks like HBR has atleast 8 derelicts in their yard, mainly power that would normally be used the grain train season. The units 3001 to 3003 were being used when I left on Thursday around 8:30am. Man, that yard looks fairly bare (even factoring in Christmas being quiet for them)compared to even 2 years ago! Hey Steve! Great recap of a pretty great year. It's been great learning more about trains and thanks for putting my elevator photos up! Everything is looking good. I have to say, your Piney post has always stuck with me and someday I hope to see it in person. I can't imagine how much time you spent editing and touching up 15,000 photos! We definitely appreciate your sharing them with us. You have an awesome talent. Eric I have to admit that some of your style of blogging appeals to me - the longer, more thematic posts instead of my more typical "I saw this today" posts. Jenn Thanks for the nice comments and for sharing your elevator posts with www.grainelevators.ca! I think that Piney post struck a chord with a lot of people! Karl Fortunately I haven't touched all 15,000 photos, but I'm sure I've edited over a thousand of them. Thanks so much for the kind comments. I always enjoy seeing and reading about your modeling talent.